The first few weeks of this orphaned rhino baby's life haven't been easy - but thanks to the tireless care and tender affection of his new human "parent," the little animal is now beginning to thrive. Born last month in the South African wilderness, the rhino baby named Orion was abandoned by his mother not long after. He stood little chance of surviving on his own, but fortunately he wasn't alone for long. Ranger Divan Grobler, from the Aquila Private Game Reserve, was among those who came to Orion's aid. After trying, unsuccessfully, to reunite the newborn rhino with his mom, they were left with no other choice than to step in as his caregivers. That's when the real work began. For the last couple of weeks now, Grobler has served as a surrogate mother to baby Orion, a duty that he calls "an honor" - even though, as you might expect, it's led to some sleepless nights. "It's a full-time job," Grobler told The Dodo. "It's like having a child. He's fed every two hours. It's a very delicate operation. The first weeks are most critical". "He's showing me a side to these animals that I never expected. They are emotionally intelligent, but also actually intelligent. I have a ring on my cell phone to remind me when its time for a feeding. As soon as the tone plays, he immediately runs toward me to say, 'I want the bottle!'" With a full belly from those regular feedings, little Orion has only gotten stronger. But like all mothers know, raising a happy baby is as much about keeping them filled with love as well. For that, Grobler has started a sweet little tradition - reading a bedtime story for the little rhino as he dozes off on his lap. "I read to him to let him know that he's in a safe environment," he said. "I think it's emotionally comforting to him to know that someone is there. In the wild, his mom would give him love and attention. You need to give them that love." All that love has been paying off. Orion's close bond with his human parent is easy to see, especially as they head outside to run and play. 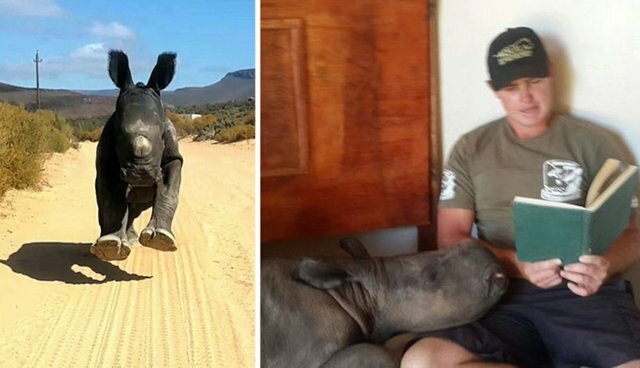 As cute as Orion and Grobler's relationship is, the efforts to give this rhino a fighting chance couldn't be more important. If all goes well, Orion will gradually be prepared for reintroduction into the wild where his species' numbers have been in decline. "It's quite an honor to be part of something that critical at this stage of our rhino poaching situation in South Africa. We're losing one rhino about every eight hours due to poaching," said Grobler. "I'm optimistic about Orion's future. He's got a good fighting spirit. We've got a good plan to get him back into the wild where he belongs, to contribute to future conservation." Click here to find out how you can help South Africa's orphaned rhinos.